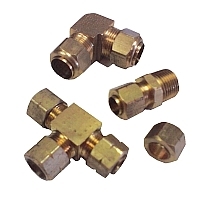 Brass Body Stastrate Compression Fittings by Fluidline Approved Vendors incorporate a captive compression fitting "Stastrate" sleeve which is an integral part of the nut making assembly easier and faster than with "standard" compression fittings. Fittings are compatible with brass, aluminum, and copper tubing. They are also compatible with Thermoplastic Tubing when used with a # 59 O.D. Tube Insert .